ALEXANDRE ZOUARI | MISAKI Co.,Ltd. Originated from Paris, the city of romance, Alexandre Zouari is France’s topnotch hair accessory brand founded by Mr. Alexandre Zouari. Acclaimed for his creative talent, Mr. Zouari’s unparalleled imagination breathes life and colour into the Alexandre Zouari brand. Just as his magic hands can dress women in impeccable style from top to toe, Mr. Zouari’s luxe hair accessory creations attract the most chic and beautiful clientele. Nowadays, hair accessories by Alexandre Zouari have become a must-have fashion statement for the world’s most glamorous celebrities and Royal family members. 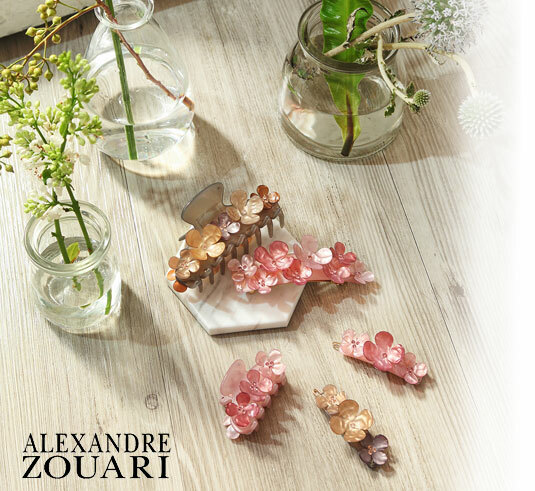 From form-sculpting, polishing, sewing to stone-setting, every beautiful detail of Alexandre Zouari’s glorious hair accessories is accomplished by the skilful hands of top-class European artisans, with love and passion. The prestigious service is Alexandre Zouari’s answer to customers’ popular requests. There are an increasing number of discerning clients who are looking for a “one-of-a-kind” hair accessory to create the perfect look with their cocktail dress, evening gown or favourite daily fashion. From now on, Alexandre Zouari’s VIP customers can choose any hair accessories they love from the brand’s “Haute Couture” collection and propose the alterations they desire, from adapting the colour, the size, the use of luxe materials (such as luxe fabric, leather, plexiglass, metal or fur, etc.) to the decoration details of crystals and Bohemian stones. Customers’ specific requests will be submitted to Alexandre Zouari’s team of experienced artisans in Europe to create the one-of-a-kind haute couture hair piece. Alternatively, customers may also send in a photo of the dress or fashion they have in mind and Alexandre Zouari’s expert in Europe can custom design a unique hair accessory that matches impeccably with the fashion style. This dream-comes-true service is now available to all of Alexandre Zouari’s VIP customers. Alexandre Zouari is dedicated to enhance the beauty of modern women. To achieve this ideal, the brand’s hair accessory designs have more to offer apart from its outstanding fashion style and colourful dazzle. The artistic touch is what makes Alexandre Zouari truly unique and excelled in making hair accessories with a distinctive French flair of romance. The intricate craftsmanship of an elaborate Alexandre Zouari hair piece may require up to dozens of steps to complete. And, every step is hand-crafted by the brand’s top artisans painstakingly in Europe. Each finished piece can be compared to a work of art. In order to materialize Mr. Zouari’s creative ideas in the best light, the brand’s master artisans always study his sketches carefully to come up with the most innovative and beautiful material combinations. Couture fabrics, luxe leathers, fur, cellulose, Swarovski elements, metallic studs, etc., are mixed and matched in the most resourceful manner. Numerous trials and tests are done before selecting the final combo to achieve the most amazing and stunning visual effect.